I hadn’t quite decided on this week’s blog topic when I saw an e-mail snagged in my spam folder. The sender was “IRS”. The heading was “Second Notice of Delinquent Taxes”. What a gift! A blog topic! Like many taxpayers who receive a message from the “IRS” dunning them for cash, I knew that I didn’t owe the IRS anything. Thankfully, I knew better than to open or reply to it. Keep reading to know how to identify phishing, and what to do when it happens to you. Phishing is a scam usually done through unsolicited email and/or websites that pose as legitimate senders or sites. Scammers use phishing to lure unsuspecting victims to provide personal and financial information. Bogus emails can appear to come from the IRS or your tax professional requesting information, including mother’s maiden name, passport and account information that is used to steal your identity and assets. How do I know if it’s phishing or really the IRS? The easiest way to check for phishing is to place your cursor over the sender’s name, revealing the sender’s e-mail address. An address that doesn’t look legitimate is probably a scam. For the IRS, anything other than “irs.gov” is suspect. The IRS doesn’t initiate contact with taxpayers by email, texts or social media to request money or financial information. Most IRS communication is still through the good, old-fashioned USPS. What should I do with a phishing e-mail claiming to be from the IRS? Don’t open any attachments. They can contain malicious code that may infect your computer or mobile phone. Don’t click on any links. Visit the IRS’ identity protection page if you clicked on links in a suspicious email or website and entered confidential information. Forward the email as-is to the IRS at [email protected]. Don’t get phished! When you get an e-mail that looks suspicious or is from an unfamiliar sender, stop and check it out before deciding to open it. If it’s phishing for your tax dollars, don’t even think about opening it! Just forward to [email protected] and delete! Real estate professionals take a lot of training and pass a really tough exam to earn a license to conduct business. Buyers and sellers of real estate are depending on their knowledgeable agent or broker to locate properties, bring the parties together, and navigate transactions to the settlement table. Unfortunately, all that training and exam-taking doesn’t cover the special IRS tax rules that real estate professionals need to know and understand. Real estate professionals who don’t know the rules could end up getting an unwelcome tax notice about underpaying or incorrect filing. Real estate professionals operate their business as a sole proprietorship, unless the she or he forms a partnership or incorporates. The IRS considers licensed real estate professional as statutory nonemployees and treated as self-employed. This is because substantially all payments for their services are directly related to sales or other output, rather than to the number of hours worked. Real estate services are often performed under a written service contract providing that they will not be treated as employees. Real estate professionals are individually responsible for filing and paying all taxes, including federal, state, and local income, as applicable. Business income and expenses are reported on Schedule C, “Profit or Loss from Business,” and filed with the individual income tax return. Net business profits are also subject to the employer and employee portions of the Medicare and Social Security taxes (i.e., FICA), totaling 15.3% of net profit. FICA is paid to the IRS with the individual business owner’s income tax return. Expenses incurred to run a business as a sole proprietorship are deductible. The IRS does not publish an exhaustive list of eligible business deductions. The rules state that the business can deduct expenses that are “reasonable and customary” for that business. 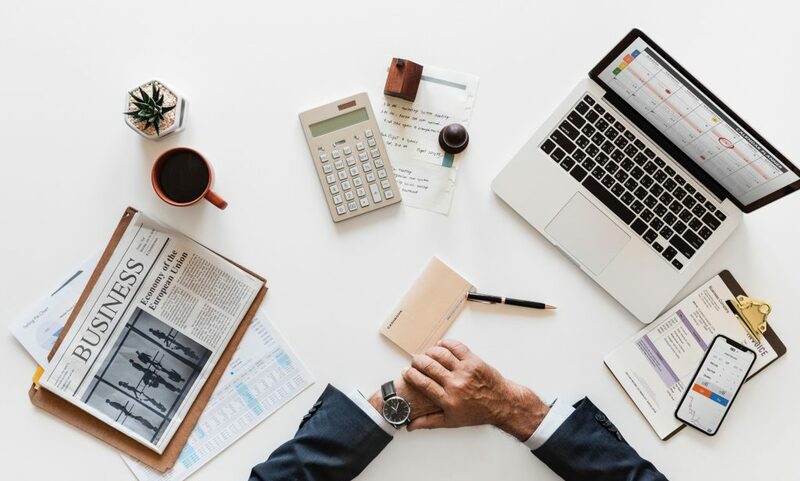 Common deductible expenses for real estate professionals include marketing, education, business licenses, and payroll taxes. Keep track of business expenses throughout the year; they really add up and reduce your taxable income. Special IRS tax rules that real estate professionals need to know and understand aren’t included in the licensing test materials. Don’t know the rules? Consult www.irs.gov or with a qualified tax professional. You’ll be very glad that you did. We all want to be like Goldilocks when we pay our income taxes – we want to get it “Just Right”. Not too hot (paying too much) or too cold (paying too little). How do you get it “Just Right” the Bear Family – eh — the IRS? Interest on underpaid taxes can be almost as scary as an angry Papa Bear! Figuring out if your tax withholding is too high or too low is easier than you think. The IRS published a Withholding Calculator for employers in January 2018, found here. It reflects the new tax law passed in December 2017. Using this tool and making any indicated adjustments can help to avoid a serious too-hot or too-cold situation when you file your taxes next year. 1. Understand Terms — Get clarification for any unfamiliar terms used in the Withholding Calculator so you answer the questions accurately. Terms like “pre-tax retirement plan,” “qualifying person,” and “taxable earned income” could mean something different than what you think. The IRS defines its terminology, but it’s not always super clear to everyone. Good news – a quick Internet search will provide links to sites where terms are explained in plain and simple language. 2. Identify Changes — Compare your life and work situation from last year to your circumstances now. If you’ve changed your marital status, purchased or sold a home, or added an employer-provided benefit, your answers for this year will be different than they were for last year. Be sure you know how to answer each question based on your life and work circumstances now. If anything else changes, you will want to go through the Withholding Calculator again later in the year. 3. Know Your Pay Frequency – Entering the wrong pay frequency, i.e., how often you get paid, really throws off the Withholding Calculator. One small difference, such as being paid bi-weekly (every other week, or 26 times a year) instead of semi-monthly (twice a month, or 24 times a year) could mean owing more money when you file your return next year. Miscalculating by two pay periods could make a significant difference. Make sure your tax withholding is “just right” with the IRS Withholding Calculator and avoid a too-hot or too-cold situation when you file your taxes next year. Otherwise, you could be staring an angry Papa Bear in the eye next April 15! The numbers are huge! Just a few days before the tax deadline, almost 120 million tax returns had been filed. More than 70% of those tax returns resulted in refunds back to the taxpayers totaling almost $243.6 billion. The average refund check or direct deposit amount was $2,831, slightly larger than last tax season. So how do American’s spend their tax refunds? GOBankingRates, a financial information and resources website, recently polled American taxpayers about how they planned to spend their tax refunds. The results were encouraging for money folks who preach fiscal responsibility. Here’s the full article. It’s an interesting read. Put into Savings – Forty-three percent of the survey respondents said they will put their refunds into savings. The survey was not specific about the type of savings. Let’s hope that savings includes an emergency fund for immediate needs and retirement contributions to meet long term goals. Pay Off Debt – Thirty-six percent said they will use the money to pay off debt. If that’s your situation, too, start by paying debt with the highest interest rate, like a credit card balance. More debt to pay after your refund is all used? Shift the amount you were paying on the paid-off balance to the next largest debt to get it paid off more quickly. Pay Toward a Vacation – Ten percent set aside their refund to pay for a vacation. Seems like a nice reward for getting through the year and filing that tax return. If your vacation funding choices are limited to putting it on a credit card or waiting for your tax refund, the refund “wins” every time – unless you can pay the card balance off each month. Splurge on a Luxury Item – Six percent go out and buy themselves a gift, whatever their heart desires. The bigger the refund, the bigger the splurge – jewelry, car, latest “bright, shiny object”. Let’s hope that these folks feel okay doing this because they already saved an emergency fund and maximized their retirement contributions. Necessary Major Purchase – Five percent need to use their refund for a major necessary purchase, like a home repair or appliance. Waiting to buy something you really need can be stressful, or even unsafe. Setting aside funds for emergencies and maintaining good credit are two ways taxpayers can avoid waiting for major purchases. What about getting no refund? The GOBankingRates survey found that 36 percent of those polled this year didn’t expect to receive a tax refund. Why is that a smart move? Well, you’ll have to check back and read my next blog to find out.